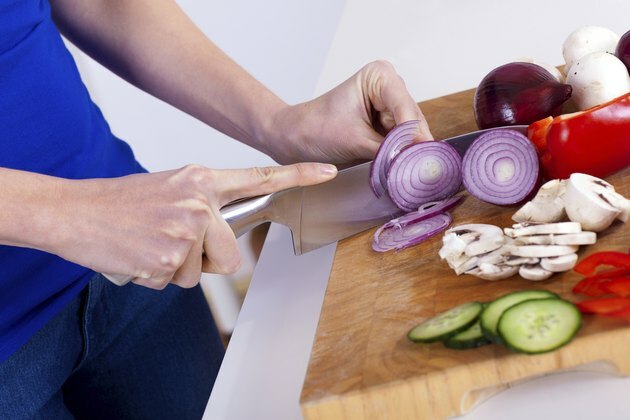 Sautéing raw onions brings out the natural sugars, rendering them tender and sweet, which is why they are referred to as “caramelized onions.” Technically, the word sauté means to cook something in oil over direct heat, but as technology changes, cooking terms evolve. "Sautéing" onions in the microwave gives you soft, golden onions with none of the hassle or heat of a skillet. Microwave frying onions is also much faster, which is important when you’ve got pasta or a burger waiting. Peel your onion and cut it in half lengthwise. Lay the halves cut side down and slice them from top to bottom. Make the slices as uniform as you can so that they cook evenly. Place the onion slices into a microwave-safe bowl. Drizzle just enough olive oil over them to coat lightly. Add coarse salt to taste. Salt will help soften the onion slices. Add cracked pepper to taste and toss the onion slices well. Cover the microwave-safe dish with its lid and microwave the onion slices on high for 5 to 7 minutes. Toss the onion slices again and cook them uncovered for another 2 to 3 minutes, or until they are tender and limp. Add a splash of vinegar or white wine for a slightly more tart result.